This is my first blog post and let me start out by telling you something. My personal preferences on technology will change. My comments and views on the related might not settle well with everyone! And that’s perfectly fine, because I enjoy input no matter how harsh. With that said, let’s start off by introducing these two wonderful products. The Windows PC and the Apple Macintosh. Both of these are great products. They are ready right out of the box and once you turn them on, they are extremely easy to use. But you’re probably wondering what’s the difference? Besides the obvious, that they are run on completely different operating systems, these two types of computers have extremely different looks. The Windows PC is not made by Microsoft! They build an operating system around which companies like Dell, Sony, Asus, and alike can run their products. Apple on the other hand, develops its’ own computer from scratch, and provides the operating system in house. That would be the first difference between the two. Another difference is the price tag! Apple laptops start at $1200, and yes I’m definitely going to round it up because seriously, what’s a dollar more gonna do? That’s what you’re looking at for the minimum price of an Apple laptop. That would be the 13′ MacBook Pro. The MacBook Air is not going to be used in this demonstration for the lack of specs that a typical college student would need. Then there’s Microsoft’s Personal Computers (PC). The Acer Aspire starts at $584 on the Microsoft Store site but I’m sure there are cheaper ones out there. It comes equipped with everything Apple’s MacBook Pro has. 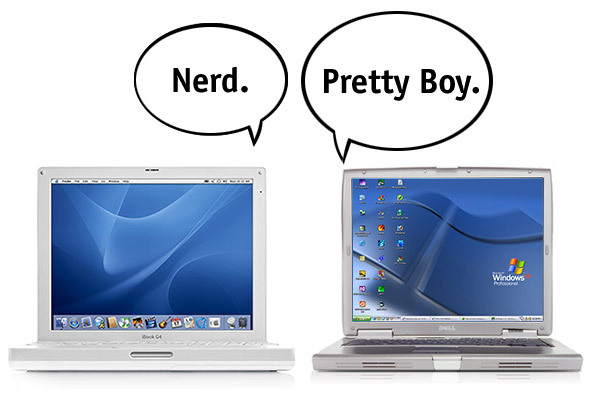 Besides the fact that the Acer Aspire has a 15.6′ screen. Look, I realize that Apple products aren’t about operation. They are about image right? You are in lecture one morning and the kid next to you pulls out his brand spanking new Mac and you drool over it. The nice white color, clean interface, and basic look to it. I myself was close to asking for one for my college classes. But then something hit me! The Lion operating system isn’t compatible with a lot of programs. Sure, major ones can be run on a Mac, but many of them can not. If the software is available, it is in Beta form and prone to bugs and glitches! So if you are a parent wondering whether or not to buy a Macintosh for your child or self, take the above into consideration. The truth is, 99.9% of software is made for Windows PC. Plain and simple. This is not a hate post for all of you reading this! Everything I have said is true and if you do not believe me, go out on your own and see what you find. I own many Apple products and wouldn’t trade them for anything you could give me! The iPhone has been my favorite phone yet, and my iPods have great. But that is where it stops for me I’m afraid. Perhaps when Apple drops the rates of their products way down, is when I will consider getting one. Because if I bought an Apple computer, I would still need my Windows PC I currently have to do most of my day to day things.